Attribute Charts are a set of control charts specifically designed for Attributes data (i.e. counts data). 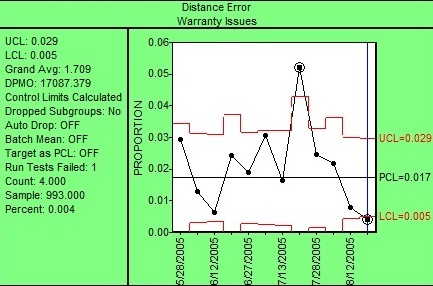 Attribute charts monitor the process location and variation over time in a single chart. c-Chart: for monitoring the number of times a condition occurs, relative to a constant sample size, when each sample can have more than one instance of the condition. u-Chart: for monitoring the percent of samples having the condition, relative to either a fixed or varying sample size, when each sample can have more than one instance of the condition.